Have you heard the buzz yet? 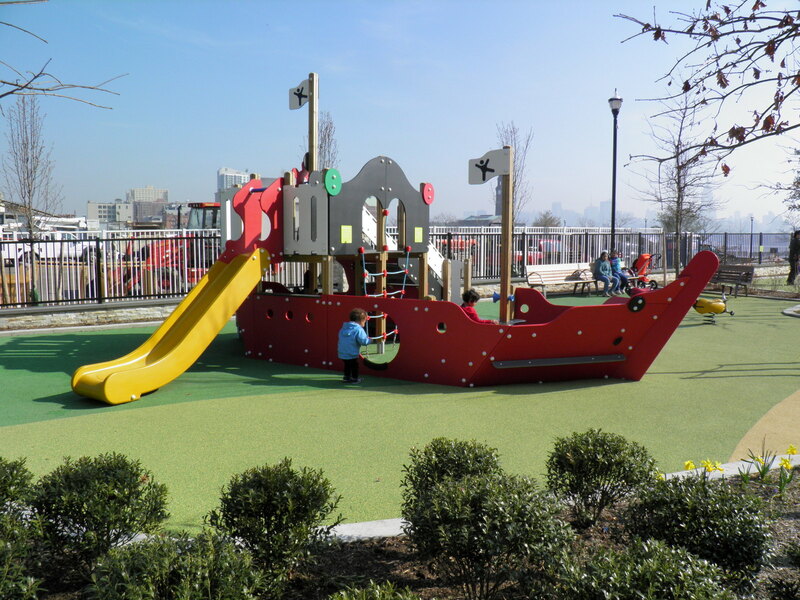 Newport Green, the fabulous waterfront park & playground in downtown Jersey City, was opened to the public earlier this year. 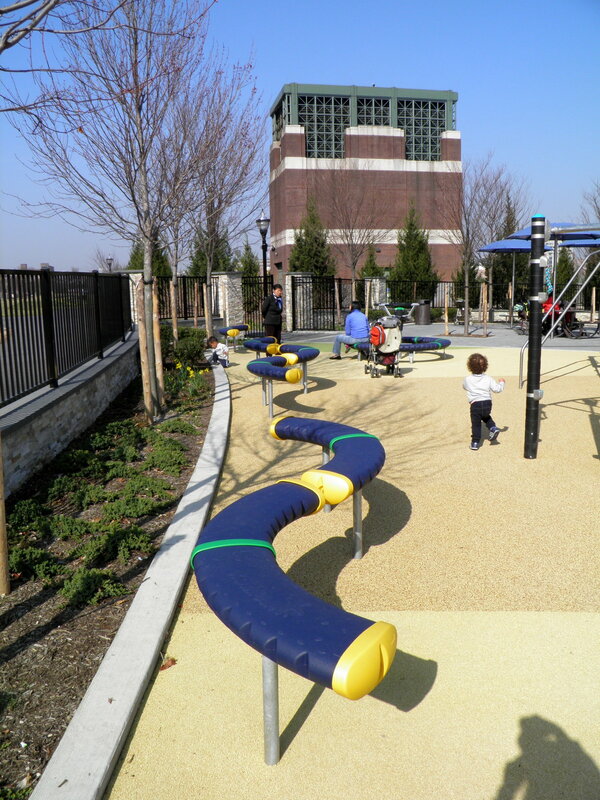 The park is only partially finished – The Oval and the playground are open, but the Fountain Plaza is still under construction. If you haven’t been there yet, I suggest you plan a visit soon. But beware – it gets packed! So time your visit wisely. It’s more bearable in the morning when most of the kids are at school. 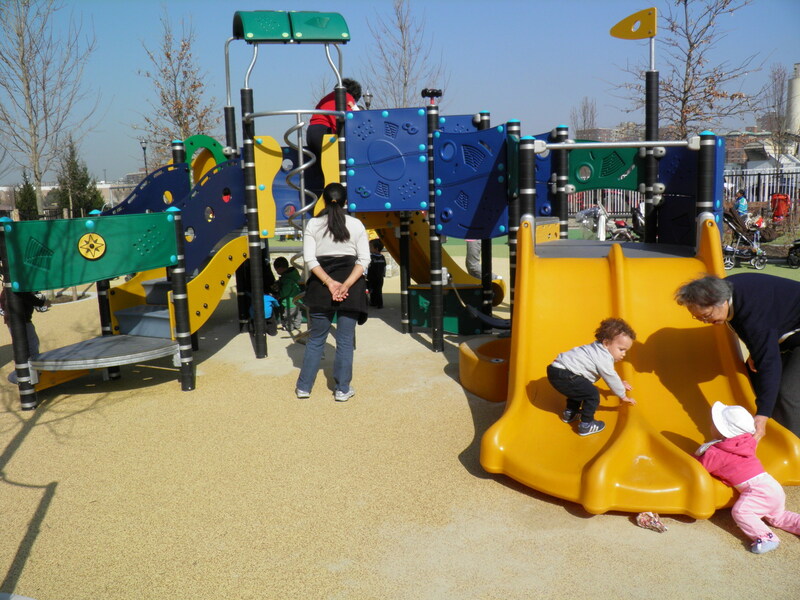 The playground is brand new and perfect for all ages, and the biggest plus is that it’s clean, no empty bags and bottles anywhere to be seen. 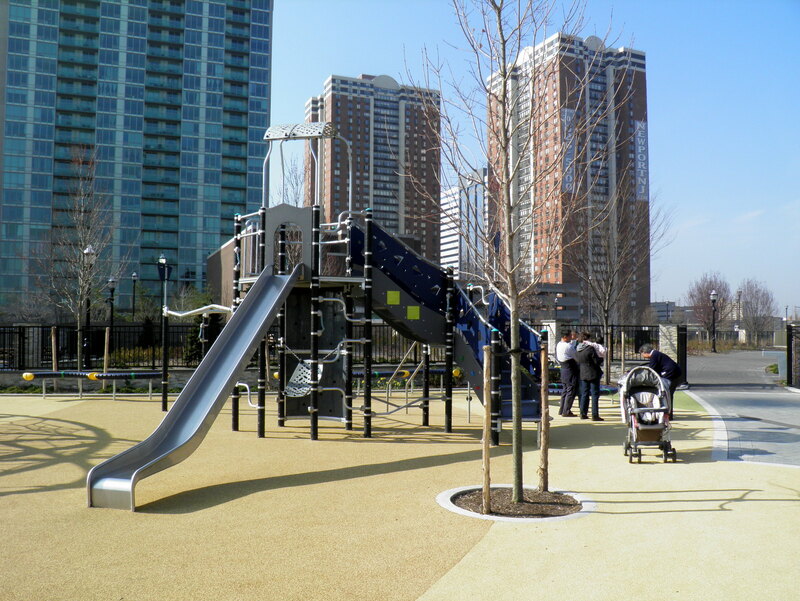 The biggest pain though is parking – it is virtually nonexistent. 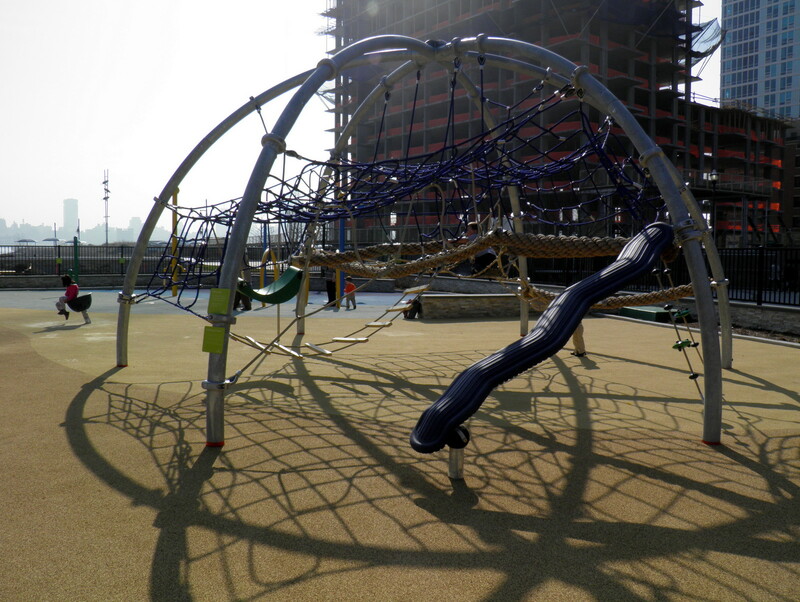 Although you can park by the Aquablu towers, the parking is metered ($1.50) and limited to a maximum of one lousy hour. 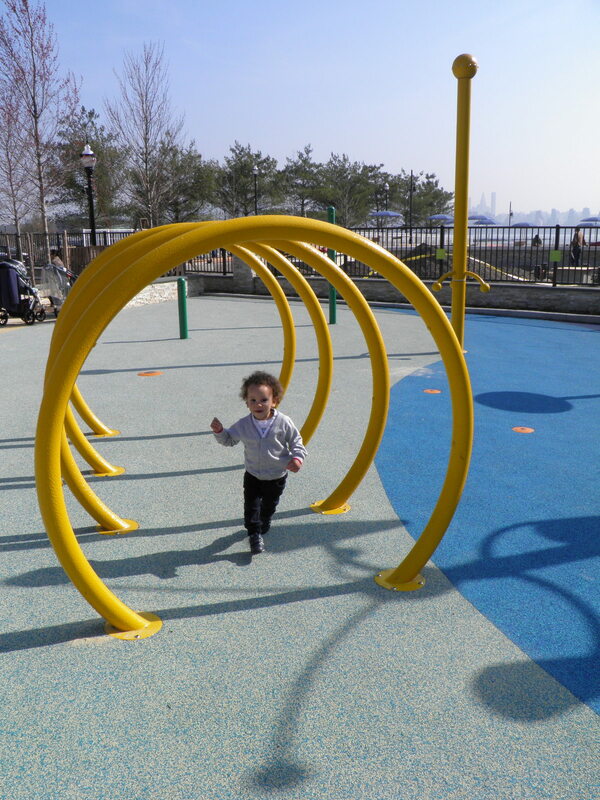 What is one hour when your little peanut is having so much fun… You might get lucky and find an empty non-metered spot a little further, but the time limit is just a slight improvement – 2 hours max. 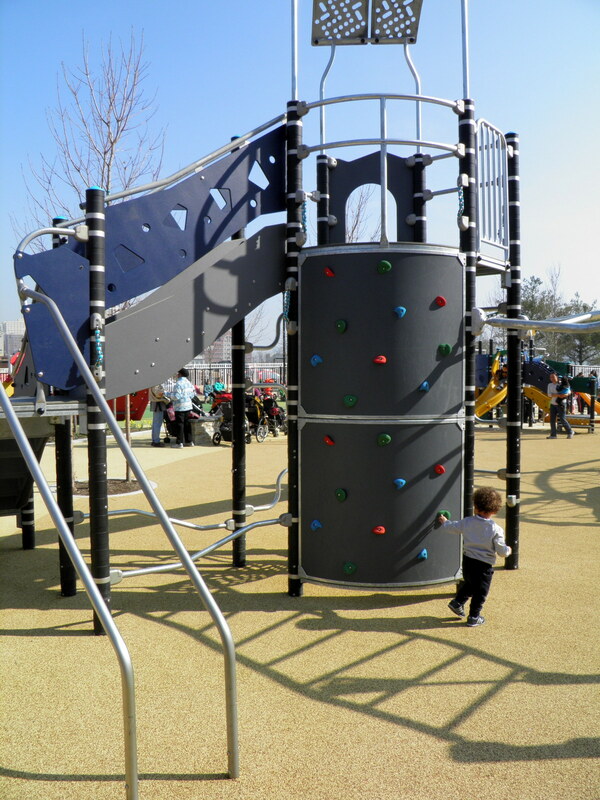 Alternatively, you can use Light Rail and get off at Pavonia-Newport, it’s a quick 5-minute walk to the playground. Or maybe you live close enough to walk from your house. 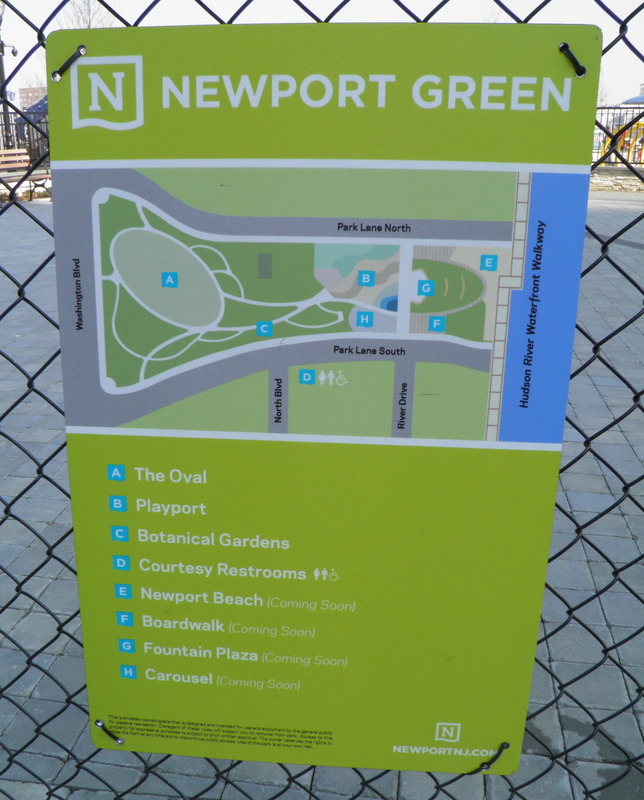 Newport Green is located between 14th Street (Park Lane South), Washington Boulevard, and Hudson River Waterfront Walkway, directly across the street from Target, next to Aquablu. 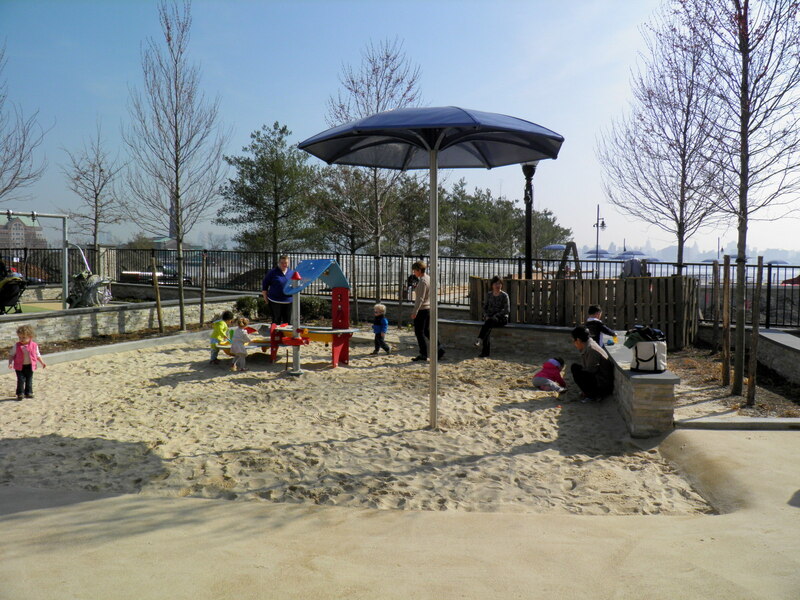 It’s on the waterfront so the views of Manhattan are spectacular and the breeze is refreshing. 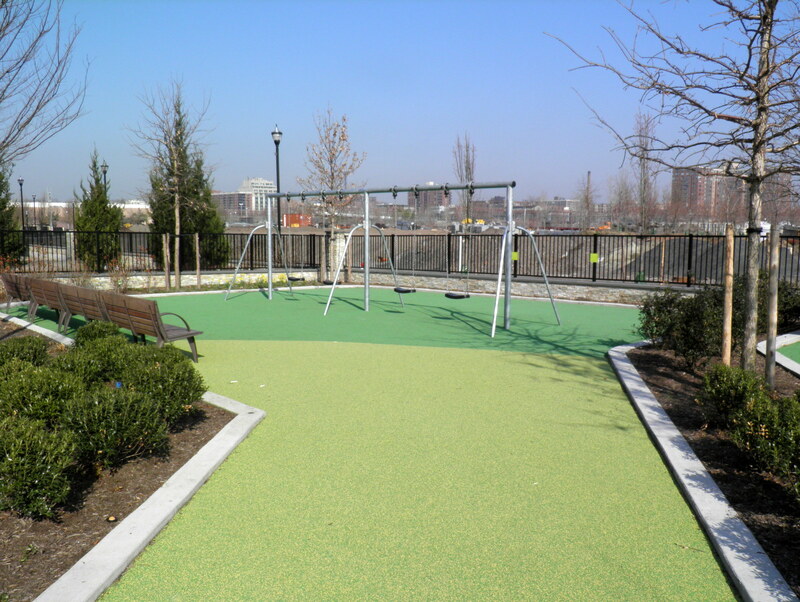 It is on the same level as Greenwich Village and you can see the World Trade Center and the Woolworth Building to the right, and the majestic Empire State Building to the left. 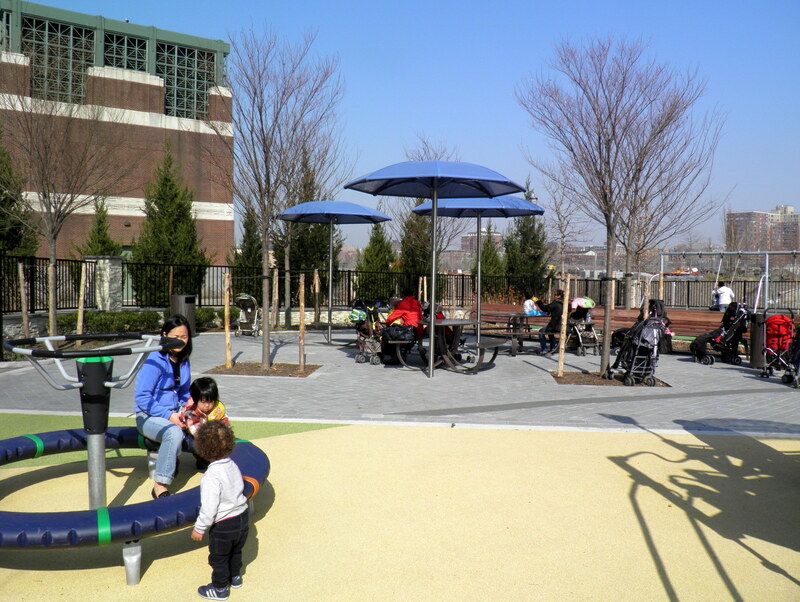 There are 3 tables with benches and umbrellas right by the entrance to the playground so snack time is easy and shaded. 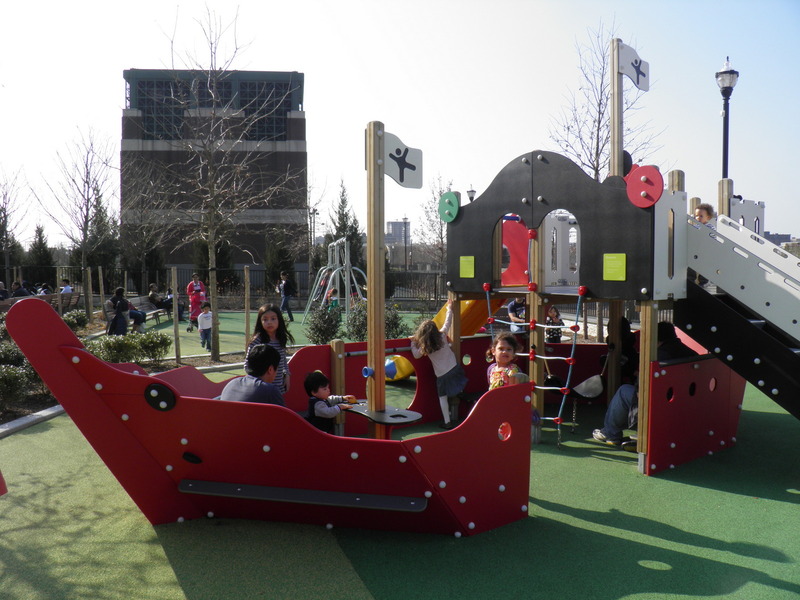 There are plenty of benches around the playground for additional seating for tired caretakers. 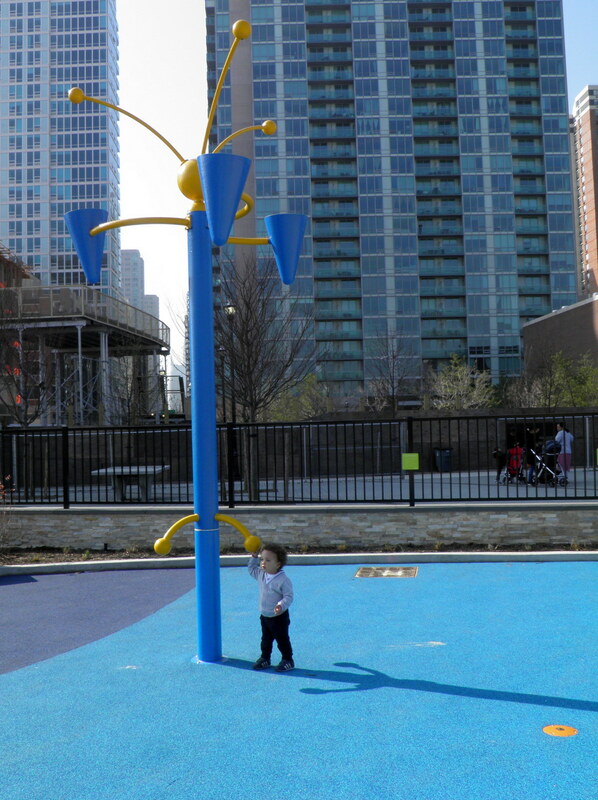 There are a few umbrellas around the playground, however, they are on the smaller side. 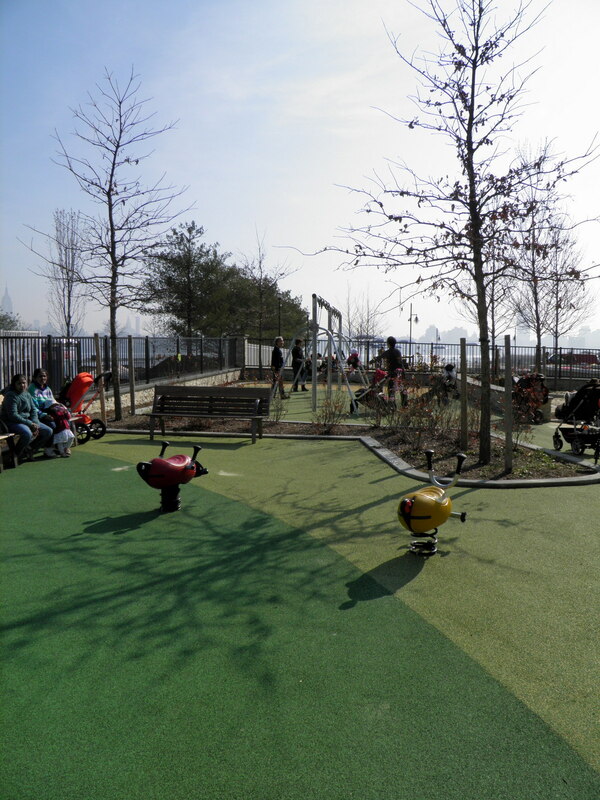 They also planted quite a good amount of trees in the playground but they are new and leaf-less for now (or were in mid March when I took these pictures). I promise to post more pictures once the trees turn green.